Dedicated to quality online learning. 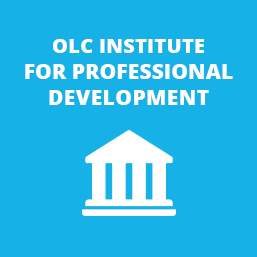 Here you’ll find our policies, procedures and technical requirements for programs at the OLC Institute of Professional Development. Click here for our technical requirements for all of our programs. Registration closes 24 hours prior to the start date/time of the Foundation course(e.g. if the start date is Monday at 12:00pm ET, registration closes at 12:00pm ET on Sunday). Upon registering and paying for the certificate program, you will receive an email confirming your registration. Late registrations will not be accepted. Please note that once the enrollment cap has been met on any OLC offering, it will be up to the discretion of the Institute to allow/deny any additional registrations. OLC offers multiple start dates for the Certificate Program throughout the year. Please review the additional dates to locate an alternate cohort. With the exception of holidays, regular customer service hours are available Monday – Friday from 9am – 5pm ET. The Thursday before the course start date, participants will receive an email with directions and an enrollment key to access all course materials and activities in our LMS, at http://institute.onlinelearningconsortium.org. The enrollment key is for the participant’s personal use and should not be shared with anyone. Once the Foundation course opens, the enrollment key can be used at any time to access the course. Participants will have access to the Foundation course for 365 days starting on the day they enroll. Transfer requests made prior to enrolling in the Foundation course will be granted without an additional fee. Certificate participants may request to transfer to a later cohort before the end of week 4 of the Foundation course. After the end of week 4, transfer requests will be charged an administrative fee of $350. This request cannot be made more than once. Note: That transferring to a later Foundation course cohort entails re-submitting all work and participating in all weeks of the course. Requesting an additional transfer will result in an administrative fee of $350. OLC Online Teaching Certificate Program is a three-phase program that must be completed within one year from the start of the Foundation course. At the end of the Foundation course, mentors will be assigned only to those participants who are completing the entire Certificate program. Participants completing only the Foundation course may change their minds to complete the entire Online Teaching Certificate Program up to one month after the Foundation course ends. A mentor will be assigned at that time. Requests received after the one-month mark will not be granted. Participants must successfully complete their elective workshops or mastery series, and receive an Award of Completion, in order for the workshop or mastery series to be counted towards the completion of the Certificate program. Participants who do not successfully complete their elective options will have to retake the workshop at an additional cost and still complete the program within the one year. Only the workshops or the mastery series taken after the start date of the Foundation course will count towards electives. Participants who are not able to complete all three phases by the one-year deadline may request a one-time extension of three months for an administrative fee of $350, as long as their mentors agree to work with them for the duration of the extension. All participants of the OLC Teaching Certificate Program are expected to adhere to the OLC Netiquette Guidelines. OLC is committed to providing reasonable accommodations for all participants in accordance with federal guidelines. If you have a disability, use assistive technology, or need accommodation to fully access a series or workshop, please notify us during your registration by checking the accommodation box, providing information about the kind of accommodation you would need, and email us at certificate@onlinelearning-c.org at least one week in advance of the program start date. You will be contacted by our OLC Institute staff to discuss your needs. Participants who want/need an Award of Completion for the Foundation workshop must complete all required and graded activities and have a course total of 100%. All participants will have the opportunity to submit work for a grade (by the listed assignment deadline) and, if necessary, a one-time opportunity to revise and resubmit their work to achieve a passing grade. Anyone needing or wanting to submit work past the assignment deadline must get approval, in writing, from the faculty member. Only faculty can determine if a participant may submit work after the deadline. Plagiarism, the passing off of other’s words, ideas, research, or other intellectual or artistic work as your own (intentional or unintentional), is not acceptable in any of the OLC offerings and may result in removal from the program. Participants are required to follow proper citation conventions when using outside resources. Once you have successfully completed the certificate program, please make sure to download a copy of your award/certificate of completion from the course site. Please note that once your access to the course expires, you will not be able to download your award of completion, and we will be unable to grant requests for certificate copies, transcripts, and course completion records. Successful participants will also receive a digital badge of completion for the program via Credly. Instructions will be sent out for how to access your badge once issued. Please note that badges will not be issued for programs prior to 2018. OLC strives to deliver all offerings as scheduled. However, we reserve the right to reschedule or cancel a program due to unforeseen extenuating circumstances or low registration. If this happens, OLC will give as much advanced notice as possible. In the event a Foundation cohort is canceled or rescheduled, participants will be given the opportunity to select another offering in the same calendar year that fits their schedule and their registration payment will be applied to that event. Unless stated otherwise, OLC and/or workshop facilitators retain copyright on all workshop and series materials. Please do not copy materials or distribute them to anyone without prior written approval from the copyright owner. Special Note: The workshop and series content remains the property of OLC. Any product/content that faculty or participants create as a result of participating in an OLC program becomes the property of that individual. *If you do not meet prerequisites for the Advanced Online Teaching Certificate, please take our Online Teaching Certificate program. Upon registering and paying for the advanced certificate program, you will receive an email confirming your registration. Late registrations are not accepted. Please note that once the enrollment cap has been met on any OLC offering, it will be up to the discretion of the Institute to allow/deny any additional registrations. OLC offers multiple start dates for the Advanced Teaching Certificate Program throughout the year. Please review the additional dates to locate an alternate cohort. Regular Customer Service hours are available with the exception of holidays Monday – Friday from 9am – 5pm ET. 4 days before the event begins, participants will receive an email with directions and an enrollment key to activate access to all materials and activities at http://institute.onlinelearningconsortium.org. This enrollment key is for the individual participant’s use and should not be shared with anyone else. Once the Advanced Teaching Certificate begins, the enrollment key can be used at any time to access the workshop. Participants will have access to the course for 365 days starting on the day they enroll. Certificate participants may make a one-time request to transfer to a later cohort before the end of week 3 of the certificate program. After the end of week 3, transfer requests will be charged an administrative fee of $350. Note: That transferring to a later cohort entails resubmitting all work and participating in all weeks of the workshop. All participants of the OLC Advanced Teaching Certificate Program are expected to adhere to the OLC Netiquette Guidelines. OLC is committed to providing reasonable accommodations for all participants in accordance with federal guidelines. If you have a disability, use assistive technology, or need an accommodation to fully access a workshop, please notify us during your registration by checking the accommodation box, providing information about the kind of accommodation you would need, and email us at certificate@onlinelearning-c.org at least one week in advance of the program start date. You will be contacted by someone from our OLC Institute staff to discuss your needs. All participant who want/need to receive an Award of Completion for the Advanced Teaching Certificate program must complete all required and graded activities and have >90% for course total. Assignments will be graded within 3 business days of the due date and email notifications, via the News Forum, will be sent to all participants to inform them of their grades. Participants can revise assignments that do not achieve a passing grade, but they must submit their revisions within 2 days of their original grade being posted. Participants must get approval from the facilitator to revise an assignment. No late assignments are accepted. Anyone needing or wanting to submit work past the assignment deadline must get approval, in writing, from the facilitator. Only the facilitator can determine if a participant can submit work late. All requirements for the Advanced Teaching Certificate program must be completed during the course dates. No requests for extensions will be accepted after the final presentation dates. If you do not complete the course during the scheduled time, and you wish to continue the program, you will have to move to the next cohort and pay for the course again. Once you have successfully completed the advanced certificate program, please make sure to download a copy of your award/certificate of completion from the course site. Please note that once your access to the course expires, you will not be able to download your award of completion, and we will be unable to grant requests for certificate copies, transcripts, and course completion records. OLC strives to deliver all offerings as scheduled. However, if fewer than 10 people register, or if a facilitator falls ill, we reserve the right to re-schedule or cancel a program due to unforeseen extenuating circumstances or low registration. If this happens, OLC will give as much advanced notice as possible. In the event a cohort is canceled or rescheduled, participants will be given the opportunity to select another offering in the same calendar year that fits their schedule and their registration payment will be applied to that event. No refunds will be given. Transfer requests made prior to Week 3 will be granted without an additional fee. Certificate participants may request to transfer to a later cohort before the end of week 3. After the end of week 3, transfer requests will be charged an administrative fee of $350. This request cannot be made more than twice. Note: That transferring to a later course cohort entails re-submitting all work and participating in all weeks of the course. Requesting an additional transfer will result in an administrative fee of $350. Special Note: The workshop and series content remains the property of OLC. Any product/content that a participant creates as a result of participating in the OLC Advanced Teaching Certificate program becomes the property of that participant. Registration closes 24 hours prior to the start date/time of each course (e.g., if the start date is Wednesday at 12:00 pm ET, registration closes at 12:00pm ET on Tuesday). OLC offers start dates several times a year for the Instructional Designer Certificate program. Please review the additional dates on our website. With the exception of holidays, regular customer service hours are available on Monday – Friday from 9am – 5pm ET. The Thursday before the start date of each course in the program, participants will receive an email with directions and an enrollment key to access all course materials and activities in our LMS, at http://institute.onlinelearningconsortium.org. The enrollment key is for the participant’s personal use and should not be shared with anyone. Once the course opens, the enrollment key can be used at any time to access the course. Participants will have access to each course for 365 days starting on the first day they enroll in the course. Cohort transfer requests made prior to enrolling in the first course will be granted without an additional fee. This request cannot be made more than once. Participants may request to transfer to a later cohort before the end of week 4 of their first course in the program. After the end of week 4, transfer requests will be charged an administrative fee of $350. This request cannot be made more than once. No refunds will be given. Note that transferring to a later cohort entails re-submitting all work and participating in each course of the program, partial credit will not be given for individual courses. Requesting an additional transfer will result in an administrative fee of $350. Participants enrolled may request to transfer to a later offering of the same workshop/course before the end of week 1 of the course. After the end of week 1, transfer requests will be charged an administrative fee of $350. This request cannot be made more than once. Transfer requests made after the course has ended will not be granted. Participants who do not successfully complete the course will have to re-take the course, which includes re-registering at the normal price. No refunds will be given. Note that transferring to a later course entails re-submitting all work and participating in all weeks of the course, partial credits will not be given for individual weeks in a course. Requesting an additional transfer after the first request will result in an administrative fee of $350. The OLC Instructional Designer Certificate Program consists of 4 four-week courses. There are two options for registering for the courses in the program. This option is for participants who wish to participate in all 4 courses of the program to complete the Instructional Designer Certificate Program (a $100 discount on pricing over the a la carte option). Participants have 12 months to complete the program (all 4 courses) starting from the time they enroll in the first course. This option is for participants who may not want to complete the certificate program, but who would like to take a single course. If participants decide to complete the full Instructional Designer Program by paying for each workshop individually, they have twenty-four months from the time that they enroll in their first course to complete the entire program (note that the bundle discount does not apply to this option). All participants of the OLC Instructional Designer Program are expected to adhere to the OLC Netiquette Guidelines. Participants who want/need an Award of Completion for each course must complete all required and graded activities and have a course total of 90%. Anyone needing or wanting to submit work past the assignment deadline must get approval, in writing, from the faculty member. Only the faculty can determine if a participant may submit work after the deadline. Requests made after the course has concluded may not be granted (if it has been more than three weeks after the course has concluded, the request will be denied). Once you have successfully completed a course in the instructional designer certificate program, please make sure to download a copy of your award/certificate of completion (you will receive a certificate at the end of each course). Please note that once your access to the course expires, you will not be able to download your award of completion, and we will be unable to grant requests for certificate copies, transcripts, and course completion records. Successful participants of the entire program (not individual courses) will also receive a digital badge of completion for the program via Credly. Instructions will be sent out for how to access your badge once issued. OLC strives to deliver all offerings as scheduled. However, we reserve the right to reschedule or cancel a program due to unforeseen extenuating circumstances or low registration. If this happens, OLC will give as much advanced notice as possible. In the event an Instructional Designer Program course is canceled or rescheduled, participants will be given the opportunity to select another offering in the same calendar year that fits their schedule and their registration payment will be applied to that event. Unless stated otherwise, OLC and/or course facilitators retain copyright on all workshop and series materials. Please do not copy materials or distribute them to anyone without prior written approval from the copyright owner. Special Note: The course content remains the property of OLC. Any product/content that faculty or participants create as a result of participating in an OLC program becomes the property of that individual. Please note that for the Leadership in Online Learning Mastery Series, an additional prerequisite of administrative experience in online education is required. Registration closes 24 hours prior to the start date/time of the Mastery Series (e.g. if an offering begins on Wednesday at 12:00pm ET, registration closes at 12:00pm ET on Tuesday). Upon registering and paying for a Mastery Series offering, you will receive an email confirming your registration. All Mastery Series offered throughout the year are listed on our website under the Mastery Series schedule. On the Friday before the series start date, participants will receive an email with directions and an enrollment key to activate access to all series materials and activities in OLC’s learning management system at http://institute.onlinelearningconsortium.org. This enrollment key is for the individual participants use and should not be shared with anyone else. Once a Mastery Series begins, participants can use the enrollment key at any time to access the series. Participants will have access to that Mastery Series for 365 days starting on the day they enroll. Please note, you will need to enroll in a timely fashion to receive Recognition of Mastery for a Mastery Series. We recommend enrolling no later than the 2nd day of the first module. If you request a transfer prior to enrolling, you can transfer without an additional fee. If you request a transfer after beginning the Mastery Series, you will be charged an administrative fee of $350. This request cannot be made more than once. Partial credits will not be given for individual modules in the series. Transfer requests will be accepted, but you will have to retake the entire series, regardless of the work you completed prior to transferring. OLC Mastery Series programs are a set of three in-depth modules, each one-week long, on a specific topic. Breaks are provided in between for reflection and application of concepts. Module 1: Approximately 7 asynchronous hours of work in 7 days plus 1 synchronous hour (available as a recording). Reflection and Application 1: Approximately 2-4 asynchronous hours of work in 1.5 weeks. Module 2: Approximately 7 asynchronous hours of work in 7 days plus 1 synchronous hour (available as a recording). Reflection and Application 2: Approximately 2-4 asynchronous hours of work in 1.5 weeks. Module 3: Approximately 7 asynchronous hours in 7 days of work plus 1 synchronous hour (available as a recording). All participants in an OLC Mastery Series are expected to adhere to the OLC Netiquette Guidelines. Participants who want/need to receive an Award of Completion for the Mastery Series must complete all required and graded activities and earn a 90% or greater as their total course score. All participants will have the opportunity to submit work for a grade (by the listed assignment deadline) and, if necessary, revise and resubmit his/her work ONCE to achieve a passing grade. Anyone needing or wanting to submit work past the assignment deadline must get approval, in writing, from the facilitator. Only the facilitator determines if a participant can submit something late. All graded assignments must be completed by the due date listed. No late assignments will be accepted unless prior arrangements are made with the facilitator. Revised assignments will be graded within 3 business days and email notifications, via the News Forum, will be sent to those participants to inform them of their grades. Once you have successfully completed the mastery series, please make sure to download a copy of your award/certificate of completion from the series site. Please note that once your access to the course expires, you will not be able to download your award of completion, and we will be unable to grant requests for certificate copies, transcripts, and course completion records. OLC is committed to providing reasonable accommodations for all participants in accordance with federal guidelines. If you have a disability, use assistive technology, or need accommodation to fully access a series or workshop, please notify us during your registration by checking the accommodation box, providing information about the kind of accommodation you would need, and email us at workshop@onlinelearning-c.org at least one week in advance of the workshop or series start date. You will be contacted by someone from our OLC Institute staff to discuss your needs. OLC strives to deliver all offerings as scheduled. However, if fewer than 15 people register, or if a facilitator falls ill, we reserve the right to reschedule or cancel the Mastery Series. If this happens, we will give as much advanced notice as possible. In the event a series is canceled or rescheduled, you will be given the opportunity to select another offering in the same calendar year that fits your schedule and your registration payment will be applied to that event. No refunds will be given. Special Note: The workshop and series content remains the property of OLC. Any product/content that the participant/faculty creates as a result of participating in an OLC workshop or Mastery Series becomes the property of that participant/faculty member. Registration closes 24 hours prior to the start date/time of the workshop (e.g., if the start date is Wednesday at 12:00 pm ET, registration closes at 12:00pm ET on Tuesday). Upon registering and paying for a workshop, you will receive an email confirming your registration. OLC offers multiple start dates for the same workshop throughout the year. Please review the additional dates to locate an alternate cohort. The Thursday before the workshop start date, participants will receive an email with directions and an enrollment key to access all workshop materials and activities in our LMS, at http://institute.onlinelearningconsortium.org. The enrollment key is for the participant’s personal use and should not be shared with anyone. Once the workshop opens, participants must enroll into the offering before Tuesday at midnight for 7-day workshops, or before Wednesday at midnight for 3-day workshops. Once this deadline passes, participants must contact workshop@onlinelearning-c.org to request a transfer to a later session. Participants will have access to the workshop for 365 days starting on the day they enroll. Participants can request to transfer to a different date or a different workshop before the start date, and only if they have not used the enrollment key. Once enrolled in a workshop, transfer requests will not be granted. For transfer requests, please email workshop@onlinelearning-c.org. Transfer requests for 4-week workshops after enrolling can be made prior to the end of the first week of the workshop. After the first week of the workshop, there is an administrative fee of $350 for all transfer requests. This request cannot be made more than once. Transfer requests made after the workshop has ended will not be granted. Participants who do not successfully complete the workshop will have to re-take the workshop, which includes re-registering at the normal price. Activities and assignments designed to promote interactions with others, support critical and creative thinking about the topic, and develop skills necessary for online and blended teaching. Award of Completion available for those who enroll no later than the second day of the workshop (Tuesday) and complete all required assignments by their stated deadlines. Award of Completion available for those who enroll no later than the first day of the workshop (Wednesday) and complete all required assignments by their stated deadlines. OLC is committed to providing reasonable accommodations for all participants in accordance with federal guidelines. If you have a disability, use assistive technology, or need accommodation to fully access a series or workshop, please notify us during your registration by checking the accommodation box, providing information about the kind of accommodation you would need, and email us at workshop@onlinelearning-c.org at least one week in advance of the program start date. You will be contacted by our OLC Institute staff to discuss your needs. Once you have successfully completed the workshop, please make sure to download a copy of your award/certificate of completion from the workshop site. Please note that once your access to the course expires, you will not be able to download your award of completion, and we will be unable to grant requests for certificate copies, transcripts, and course completion records. OLC strives to deliver all offerings as scheduled. However, we reserve the right to reschedule or cancel a program due to unforeseen extenuating circumstances or low registration. If this happens, OLC will give as much advanced notice as possible. In the event a workshop is canceled or rescheduled, participants will be given the opportunity to select another offering in the same calendar year that fits their schedule and their registration payment will be applied to that event. Zoom is the leader in modern enterprise video communications with an easy, reliable cloud platform for video and audio conferencing, collaboration, chat, and webinars across mobile devices, desktops, and telephones. OLC uses an open-source LMS called Moodle for the asynchronous component of workshops. Moodle provides a flexible and user-friendly set of asynchronous collaboration and learning tools. As with most open-source technologies, the Moodle software is free, making it a very cost-effective software package for any institution or company, without sacrificing quality. Moodle is a robust environment that is dynamic, interactive, and provides cross-platform learner access through a standard web browser. System Requirements: Moodle will work in any modern web browser, however, Moodle works best in a range of specific browser types (see below).